This revised and expanded second edition continues to offer a wealth of information on a great many topics. There are over 4200 entries on glass companies; artists; company owners; designers; patterns; colors; treatments; processes; materials; marks; and terms. If you want to learn about glass, this is the place to start. The book is arranged alphabetically for ease in locating a particular topic. Where it is applicable, there is cross referencing on information on many of the subjects. Technical terms are used along with commonly used names so the reader is able to use this guide with ease. The photos include archival material; catalog reprints; patents; glass; factories; marks; advertising and labels. Here are some examples of information that is included in this volume. What is A Canne? How is borosilicate glass used? 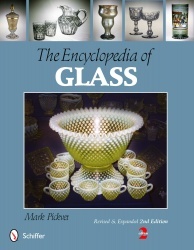 Did you that the Candlewick glass pattern was named for a type of needlework that was done by pioneer women? Helios is a name given to what type of glass? Where was Jewel Cut Glass Company located? What is maize glass? Who is James Richmond? What are seeds? Where was the Thatcher Glass Company located and what type did they make? Describe viscosity? Who was Mary Ann Zynsky? These are just a few topics that you will learn answers to as you read through this book. The 8 ½” x 11” softbound book has 286 pages with over 700 black and white photos. A bibliography is included. The book retails for $29.99 and is well worth it. The outside of the pages are marked in black blocks to indicate an alphabetical letter. This new edition easily provides a wealth of knowledge at your finger tips. We encourage you to make this book a part of your glass library. The only change I can suggest for a future volume would be to have the glass that is pictured be in color for the next update instead of having all the photos in black and white.